A.C. Overton’s (1926­-2007) family roots were in Granville and Chatham counties in North Carolina. His father, Aaron Overton, and uncle, Herman Overton, left Granville County after wilt devastated tobacco crops along the Virginia and North Carolina border. A.C. was born soon after the Overtons relocated near the Farrington community in Chatham County. Aaron trapped game to supplement his income from sharecropping in the area. A.C.’s mother, Ruth Hunt Overton, liked to sing the older ballads like “House Carpenter” and “The Butcher Boy,” as well as more modern pieces like “Darling Nellie Gray.” Aaron Overton played a few banjo tunes like “Georgia Buck” and “Old Joe Clark,” in a two-finger (thumb and first finger) style. When A.C. was eight years old, his father bought him a four-dollar banjo, with the frets removed. A bachelor throughout his life, A.C.’s uncle, Herman Overton, had time to devote to music and often performed at local dances. For a while Herman shared a house with Aaron and his family, giving A.C. the opportunity to absorb Herman’s style and repertory. There were other fiddlers, banjo players and guitarists in the family and plenty in surrounding communities, including harmonica player and guitarist, Wade Yates. By the time he was a teenager, A.C. could play the harmonica, guitar and mandolin as well as the banjo. Around the same time, A.C. struck up a friendship with bluegrass musician Allen Shelton, who had moved to Raleigh to perform on radio station WPTF. Shelton tried to teach A.C. the three-fingered roll that constitutes the backbone of bluegrass banjo playing. A.C. was unable to incorporate this pattern into his two-fingered picking. He did, however, learn to add a middle finger into his picking style without changing the old-time rhythm. He also developed a way of striking strings with the back of his thumbpick, an innovative technique that he used to add syncopation to his playing. During the early 1950s, noted folk song collector, performer and presenter Bascom Lamar Lunsford organized a folk festival at the N.C. State Fair. A.C. entered the contests that were a part of the festival and won prizes for his banjo playing. Impressed by A.C.’s artistry, Lunsford asked him to record his playing for the Library of Congress in Washington. Unfortunately, A.C. did not make the trip, and his playing remained undocumented until the 1980s. 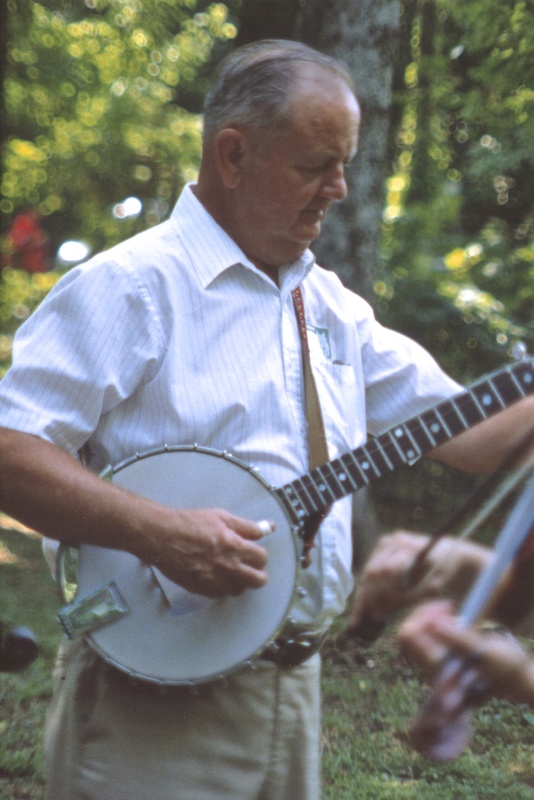 A.C. received North Carolina’s Folk Heritage Award in 1993 and performed as a guest artist at the Festival of American Fiddle Tunes, the Tennessee Banjo Institute, the Swannanoa Gathering and the Augusta Heritage Center. His playing can be heard on Sally With the Run-Down Shoes, issued on the Merimac label and on an anthology of North Carolina piedmont stringband music entitled Going Down to Raleigh. A.C. and Ava’s children, Glenda and Gerry, and now a number of grandchildren, continue to play the hymns, ballads, sacred songs and old-time dance tunes that have special significance in their family’s history as well as in the musical heritage of Piedmont North Carolina.